NAMI CCNS will offer two four-week refresher courses to only alumni of the NAMI signature courses mentioned above. As many of you were empowered in the past by the Family to Family and/or Basics courses, we know a refresher of this invaluable information will be very helpful. The class will review Crisis, Empathy, Problem Solving, Communication, and Recovery, plus offer the support of being with people just like you. 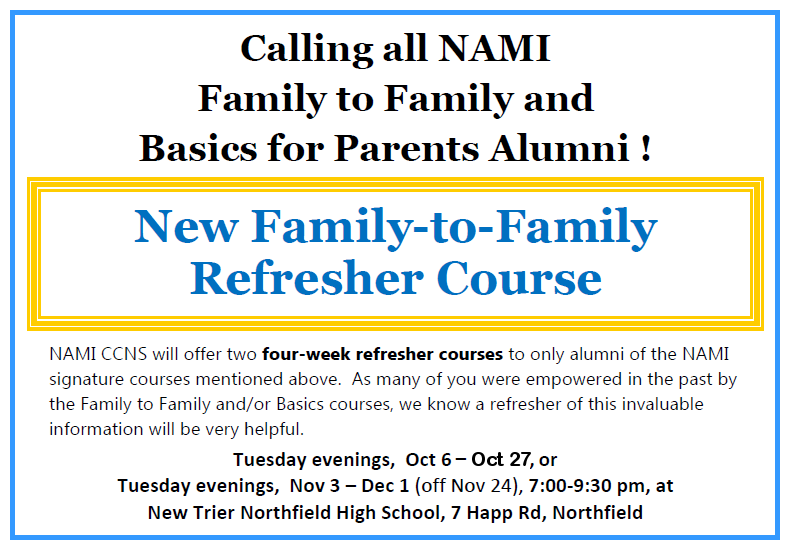 If you are not an alumni, and are interested in the Family to Family or the Basics Parenting class, please contact the NAMI CCNS office at 847-716-2252 for more information.